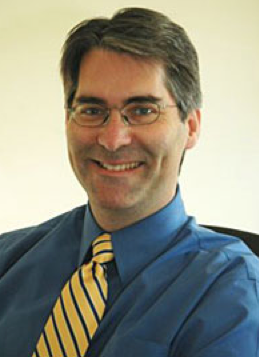 Dr. Hoffman studies the biological and environmental factors that cause obesity. His research investigates how changes in substrate oxidation may predispose an individual to an increase in body fat. Dr. Hoffman collaborates with the University of São Paulo, Brazil and the University of Southampton, UK in the study of two large, unique cohorts. In Brazil, Dr. Hoffman follows a cohort of over 600 children in the shanty towns of São Paulo in order to discern the factors that affect nutrition and health in this population. Dr. Hoffman is also involved in evaluating the roles of an influx of multinational supermarkets on obesity in transitional countries such as Bulgaria. The aim of this research is to determine the parameters that dictate whether an individual will shop exclusively at a large supermarket versus a traditional public market. In his lecture, Dr. Hoffman first discussed the current state of nutrition throughout the Developing world. Countries discussed were China, Korea, countries in Africa, and countries of the former Soviet Union. Then Dr. Hoffman discussed his own research on nutrition and children in São Paulo, Brazil. Children do not grow on a continuous basis, but, in fact, have growth spurts at specific times in the first few years of life. 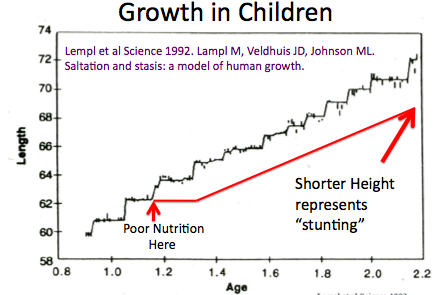 The slide depicts that undernutrition during one of these growth spurts can lead to limited growth at that particular time leading to stunting in the young adult and adult. At the same time as incidents of undernutrition in certain areas of the country, there is now occurring throughout the developing world, movement of people from rural areas to cities. Dr. Daniel Hoffman’s review article touches on a recently observed phenomenon within developing countries, obesity. The author immediately acknowledges the prevalence of worldwide obesity and goes on to offer possible causes for the increase of this disease, he then highlights the expected impact widespread obesity will have on the current health care systems within these countries. After citing the World Health Organization’s definition of obesity, the first explanation Dr. Hoffman uses to relate obesity with developing countries is urbanization. Since urbanization has made access to processed foods easier than ever, and with nearly two thirds of the world’s population living in cities, there has been a significant increase in eating habits commonly referred to as “western”. This change in diet has not only altered the way in which new city dwellers obtain food, but simultaneously lowered their total amount of physical activity and unintentionally put themselves and their family at an increased risk for obesity. In order to depict the importance of early childhood nutrition, a study from 1965 was cited, wherein children who were deprived of proper nutrition via formula strict diets scored lower on standardized tests than children who had been breastfed. Furthermore, a correlation has been found relating early undernutrition to obesity later in life. In fact, both often exist within the same household/time, a circumstance termed a double-burden of disease. On average, an obese person is likely to be 50% less productive and 88% more likely to visit a doctor within a six year period. These numbers are shocking and illustrate just how taxing a (mostly) preventable disease can be on a rising countries health care system and economic structure. One thing this article did not cover, but seems relevant to the topic is the impact religion has on the food habits and lifestyles of people living in developing countries. Many of these progressing countries are inhabited by citizens who are highly religious and/or do not understand the importance of proper nutrition. As a result, they often accept their poor health as irrelevant to this life or inherent, making their illnesses difficult to treat, even if help is available. It is also important to mention that food is a global tool of comfort. Living in a developing nation is probably pretty stressful, even if a citizen has access to health care and education, the risks associated with a “western” lifestyle may not outweigh the convenience it offers. Having one less thing to worry about (food obtainment) in exchange for possible long term health risks seems to be a trade off people in these areas are willing to accept and I don’t blame them. You bring up a really interesting point in your last paragraph! I thought Dr. Hoffman’s lecture and review article about obesity were both fascinating… Factors such as urbanization are undoubtedly a huge part of the increasing “double-burden” of disease. But your point about religion and it’s impact on food habits and lifestyles was great. The fact that a majority of people living in developing are very religious definitely impacts their overall outlook on health and wellness. Many will believe that if they are to come down with an illness it is simply “God’s will” and there isn’t much they can do about it. We have learned about this concept in our other nutrition classes, but I’ve also seen it first-hand. I spent two months in Haiti last summer and I can tell you that even the people who could afford to care for a disease (though they are pretty uncommon) or eat more nutritious food simply don’t believe in the need to do so. We can educate them as much as we want about health but at the end of the day, a good majority of these people simply believe that their fate is in God’s hands, and changing their diets or lifestyles will have no impact on their health. Thanks for bringing up such a great point, it wasn’t something that crossed my mind before, but it is definitely worth thinking about! Obesity is a rising epidemic that is seen not only in first world countries but all over the world. It seems illogical that developing countries have rising rates of obesity due to their lack of resources when compared to first world countries but this paper proves otherwise. Dr. Hoffman’s lecture revealed that as more second and third world countries move towards a more developed society, their populations are gaining more weight. The movement of people from rural areas to cities is causing a change in their life style. Urban life, when compared to rural life, is associated with less movement and a higher caloric diet. 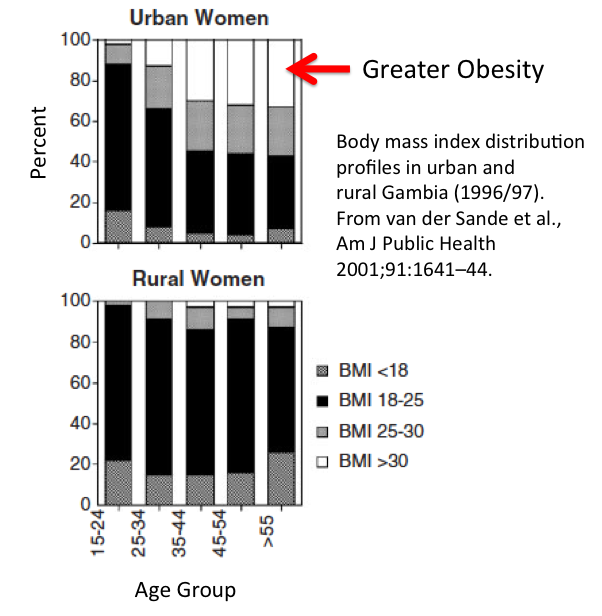 A case study of this movement to urban areas in Gambia showed that urban women had much higher rate of obesity than rural women. Along with this individual study, there are trends in developed countries where the shift from manual labor to sedentary work, the increase of television watching, and consuming ready made foods occurred there were also rising trends in obesity. The increase of obesogenic environments in developing countries directly correlates with the rise of obesity in these areas. The coexistence of obesity and malnutrition is another phenomenon of obesogenic environments. In the article it states that finding severely malnourished children who are brought in by overweight-to-obese mothers is not uncommon. This can be directly related to these children eating high caloric but low nutrient diets. It is shocking to discover that children who do have access to food are gaining weight because of the increased consumption of high caloric foods. With the rise of ready to eat foods and fast food restaurants it is easy to consume a meals throughout the day that are low in nutrients but high in calories. The article sheds light on how great an impact an obesogenic environment can make on different populations. This article’s information can be used to shape new programs to help counter act the obesogenic environments. At first I did not truly believe that there was such a thing as an “obesogenic environment” but after reading this article and attending Dr. Hoffman’s lecture it is quite apparent that it exists. Society has changed so greatly throughout the years. Once popular jobs that required hard labor have been replaced by machines, going to the grocery store or farmers market once as week has been replaced by large grocery shopping all at once, eating home made meals has been replaced by eating out or ready made meals, and playing outside has been replaced by television and video games. These changes have led to drastic changes of populations day to day energy expenditure and diets. Due to these drastic changes in society it is important to educate populations on exercising and maintaing healthy diets to counteract obesogenic environments. The rise in obesity is not directly the fault of the people because they are victims of the environment they live in. If people were educated at schools, hospitals or work it would help inform parents on how to made decisions to counteract the obesogenic environment. Education is the first step in prevention because without knowledge the population does not know that their is a problem. I agree completely with you that education is the first step in obesity prevention. I feel that for most, if not all problems are related to a lack of education. In the case of obesity, I believe that the levels will continue to rise if some sort of educational program is not enforced. I tend to take my nutrition education for granted and am often blown away by either the lack of knowledge people have when it comes to diet/health, as well as, what people believe to be true. Due to high schools cutting back on recess and physical educational classes, I think schools should be required to have a health class geared towards nutrition and healthy habits, along with a home-economics type class which students can learn how to prepare healthy meals. The more we can teach future generations the importance of their health and how to be healthy, the sooner we can conquer obesity. I found Dr. Hoffman’s lecture to be very interesting as I feel as though he has a different point of view about nutrition. I am extremely interested in child nutrition and to listen to Dr. Hoffman speak of many family’s hardships first hand is extremely sad. The fact that the country of Brazil is so poor in some areas and families are forced to use the resources they can find, can put them in serious danger in terms of health. It was interesting to me when Dr. Hoffman showed pictures of the families where the mother was overweight or obese, the father was pretty skinny and the child was either severely malnourished or stunted. As nutrition majors we are aware now that if an individual is obese they can also be food insecure and thus resulting to energy dense foods just to get something to eat. In the public eye obesity has a tendency to mean that the individual is either lazy, eats too much or has plenty of food to eat, which is a common misconception. In poorer countries such as Brazil it is extremely common that if an individual is overweight they are more than likely poor and do not have sufficient food sources. What really shocked me was the living conditions of poor families living in favelas. To think that a family with young children live in those conditions for the majority of their lives is extremely upsetting. In the United States we see photos of people similar to what Dr. Hoffman showed in the media. Malnutrition and lack of sufficient food is not a new subject and is certainly not getting resolved any time soon. People are not unaware of these issues but still there is so much lack of knowledge about what can be done to help these individuals in need. These issues are not only limited to poor or developing countries however. Many people in the Unites States do not realize how close to home these same issues can be. What many individuals living in the United States don’t know is that food insecurity, which goes hand in hand with obesity and malnutrition can be seen in every state city and town in the country. Obesity and malnutrition is a growing epidemic that has shown to be difficult to treat. Unlike disease where medication can be used to address certain symptoms, obesity and malnutrition is tied directly to food, which is a necessity for sustaining life. Nutrition on both a global and local scale is a major issue that continues to grow that if treated can potentially benefit the quality of life, health and well being of those affected. I completely agree with you when you say that there are many people in the US who are unaware of the severity of food insecurity in parts of our own country! It is really troubling that this is not common knowledge to all of us, perhaps because these issues are often swept “under the rug.” Like you said, many people in the US think that the obesity epidemic is a result of laziness and overeating, when in fact, there are many cases of obesity in food insecure homes. There have been numerous times where I’ve witnessed the snickering and assumptions made when an overweight person enters a room – and almost always, this hurtful banter includes things like “they need to lay off the (insert snack food here)” How can we get the general public to understand that obesity can just as likely be a result of a food insecure home as it can be a result of overeating. We, as nutrition majors with this information, must advocate for the awareness and prevention of food insecurity in the homes of our country. You make a great point when you mention how obesity is not an easily treated disease – most likely because it is a multi-faceted issue and not caused by just one factor. This really is a rapidly growing issue that is taking hold of an alarming number of families. I completely agree with you that Dr. Hoffman’s lecture was sad and very eye opening to childhood nutrition. He certainly has a unique perspective and background when it comes to childhood nutrition. I too was shocked by the living conditions of people living in the favelas of Brazil as well as the lack of infrastructure that occupancies those favelas. The people living in these conditions are subject to diseases that few seem to understand. One of those diseases is obesity. Like you said, people tend to think obesity is due to laziness not realizing that there are other factors that go into developing obesity. Unfortunately obesity has become a worldwide epidemic, nutrition around the globe is suffering as more countries adopt a western diet and people become more sedentary. Nutrition education around the world, certainly can benefit the quality of life health and well being of those affected. The article, The Emerging epidemic of obesity in developing countries, discusses an important problem for the developing countries in the rise of obesity. Those developing countries were suffering from mal-nutrition and have now developed obesity related diseases. Andrew M Prentice, the author of the article, talks about how the Western societies were the leaders in this obesity epidemic. He concludes that the possible reasons for this spread into the developing countries is due to the cheap and highly processed food, the social perception of obesity, and the family environment. One cannot pin point to one cause for this rising epidemic, but every single one of the problems mentioned plays a part. When comparing the urban and rural groups in the Gambia study, you can see the difference in both groups. The rural men and women had a lower percent of obese and over-weight individuals than the men and women in the urban group. This can have many connections to why the urban groups are more obese than the rural. One could be the less energy expenditure due to the easy transportation and less labor work needed. Also, more processed and less nutrient foods are easily available. An important concept in the social behavior of the developing countries that is different than the western countries is the “social stigmatism”. In the Western and more developed countries, body image is widely spread through society. A person has to have a specific look or image to be socially accepted. The media has an important role in that type of acceptance level. But in the developing countries, obesity and the over-weight look is more accepted. A study was done with the Gambia population using a body image assessment. The results confirmed that obesity and over-weight looks are more accepted especially among the middle-aged women. This shows that the society’s preference is to not on losing weight and watching what they eat. They are more socially accepted if they are over-weight or obese. I believe that trying to fight the epidemic of the rise in obesity in developing countries is very hard due to the differences in social thinking, economical stability, and healthcare systems. Those developing countries already have problems with their healthcare system, education, and sometimes sanitary so by trying to come in and add another problem, makes it ten times harder to actually solve anything. I think that western countries should try and find a solution to the obesity epidemic in their countries first. The already developed rich countries affect developing countries in the production of unhealthy snack and beverages, and fast food restaurants. So maybe they should start be helping the developing countries with their obesity problems by stopping the export of obesogenic foods. Amany, I completely agree with your thoughts in the last paragraph. They really need to work on the Western diet before they can help anyone else because so many countries blame that for their rise in obesity. Putting a stop to exporting obesogenic foods would really be a problem-solver, i definitely agree with you on that. I also believe that it is really hard to decipher what is “socially acceptable,” because, like you said, it differs from place to place all over the world. In the United States, women are expected to look like super models, but in other places, women are expected to be heavier to show they have wealth. There are so many factors to consider, but i agree with all of the points you made! I was astounded and dismayed by the information presented in Dr. Hoffman’s lecture on the “double burden of disease” and the staggering scope of the global obesity epidemic. In his 2005 review article, Prentice painted an equally troubling picture of this growing international health crisis. Developing countries continue to cope with malnutrition and infectious disease, and at the same time, they are seeing a rise in levels of obesity and chronic disease, indicative of overnutrition (hence the term “double burden of disease”). As Prentice pointed out in his review, in some cases this dichotomy of disease is seen even within the same families, with obese mothers raising children who are suffering from malnutrition. The costs of treating people for obesity and related chronic diseases, on top of those associated with treating communicable diseases and other health issues traditionally seen in developing countries, threatens to overwhelm these countries’ fragile healthcare systems. The extent of the emerging obesity epidemic in developing countries is poorly understood because there is very limited data. Many of these countries simply don’t have the resources or infrastructure to track BMI data reliably over time. This means we don’t even have a clear picture of how quickly obesity rates are rising, and which countries are seeing the greatest increases. It’s difficult to even know where to start addressing this problem if we don’t have good information on where we need to concentrate resources. In addition, it’s difficult to fathom the potential magnitude of this problem. The rates of obesity in countries like India and China sound very low (less than 5% of the population is obese in these countries), and yet these countries have over a billion inhabitants, which means even a slight increase in obesity prevalence equates to huge numbers of people coping with obesity and, potentially, heart disease, diabetes, and other serious and costly complications. Given the trajectory of obesity rates in the US and other developed countries, and the speed at which China and other developing countries are modernizing and adopting a “Western” lifestyle, it seems very likely that the emerging global obesity epidemic will quickly escalate out of control. The case study that Prentice presented on The Gambia is eye-opening. When I think about Africa, I must admit that one of the first images I still see in my mind is the emaciated, starving people we see on television in commercials for aid foundations. I don’t picture people who are overweight and sedentary, and it’s mindboggling to think that all of the health problems we’re struggling to deal with here in the US are now being exported to developing countries along with our McDonald’s burgers and high-tech gadgets. I was also surprised to read about the marked differences in obesity rates between men and women in The Gambia. Prentice doesn’t go into detail regarding the possible causes of this difference, but it seems a more sedentary lifestyle among women may be a contributing factor. I am not very knowledgeable about family structure in The Gambia, but perhaps the men still work in jobs that require physical labor, while women are less active at home or are employed in more sedentary jobs. As Prentice discussed, some of these countries view being heavier as a marker of wealth and power, which may make it less desirable to be thin. Prentice argued that the Western world’s obsession with trying to be thin has probably helped to limit the rise in obesity to some extent. However, the relationship between body image standards and weight is extremely complicated. The unrealistic ideals about thinness in Western societies contribute to a vicious cycle of disordered eating and guilt, which can contribute to weight gain. Still, it’s fair to say that if being heavy is valued in some of these developing countries, there is less incentive to maintain a low body weight. More than anything, I found the information presented in the review to be alarming and disheartening. The obesity epidemic in the US alone is overwhelming; I can’t imagine how we are going to tackle this problem at a global level. I completely agree with you Johannah that the obesity epidemic in the U.S. is by itself alarming, but when looking at obesity on a global scale, it makes the situation so much more frightening. I like that you brought up the fact that most of the developing countries do not have the technology or resources to even accurately measure and record BMI data. These countries rely on researchers, like Dr. Hoffman, from major universities to shed light on the horrible fact that obesity and malnutrition is everywhere. I agree with you that there is a pressure to be thin in the Western World, however in the developing countries obesity could very well be attributed to the fact that weight gain is a sign of wealth and prosperity in their culture. It is very concerning to me as well knowing that a mother can be overweight, however her child is stunted and malnourished. I also picture those aids and hunger relief commercials when I think about the country Africa and it is just unfathomable that people can be starving in one part of the country and yet in just a short distance away obesity exists. I strongly believe this is due to the difference between the urban and rural living areas in the developing countries. I find the topic of world nutrition very interesting and I really admire the research Dan Hoffman performs!